Before the film Cowboys & Aliens even came out I noticed that many people I talked to or read online were appalled by the very idea of the film. 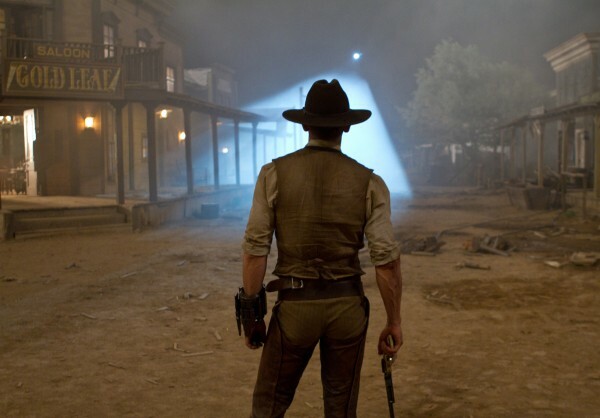 I never got, Cowboys & Aliens had a fantastic idea. If aliens are so advanced and its plausible that they can invade our time, how is it not plausible that they can invade the old west? The idea was fantastic, but when it came to the actual film, for the most part, that’s all that was there, a great idea. I don’t want to be too harsh on the film because I did find enjoyment in a majority of this film, but it essentially seemed that Jon Favreau just thought wouldn’t it be cool if cowboys and aliens were in a movie together, and then just ran with it. There was not much of an attempt to throw a compelling plot at all. It felt like the filmmakers didn’t care how good their plot was because, hell, they were making a movie in which cowboys and aliens were fighting. Where many masterful pieces of originality attempt to delve deeper into the tale at hand, Cowboys & Aliens stayed above water. Of course there’s a lot of fun to be had, I mean its COWBOYS and ALIENS, but I just found myself a bit angered because the potential for a pretty great film was squandered to make your average summer blockbuster film. Fortunately I did end up getting my fill of amazing this year, in regards to an alien movie, in the film Attack the Block, but that’s to be discussed at another time. There were some pros to be had here. Harrison Ford was fun as the sometimes brutal owner of the town. And ever since Layer Cake I’ve been a huge advocate of Daniel Craig. He does just as well here. I can’t however wait for him to act in some type of dramatic piece, because every ounce of me knows he can do it, and he can do it very well. Can anyone say, The Girl With the Dragon Tattoo. Either way, Cowboys & Alienshad some pretty awesome action sequences and some very cool aliens that certainly deviated themselves from other film aliens while still being completely menacing. Though while being entertained by Cowboys & Aliens, its not hard to realize the obvious truth. Cowboys & Aliens took a pretty great and original idea and managed to make it a very generic film. This entry was posted in All and tagged Cowboys & Aliens, Cowboys & Aliens Movie, Cowboys & Aliens Movie Review, Cowboys & Aliens Review, Cowboys and Aliens, daniel craig, harrison ford, Jon Favreau, Olivia Wilde. Bookmark the permalink.